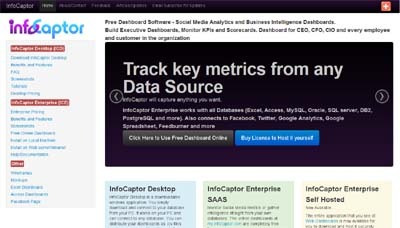 InfoCaptor Enterprise (my.infocaptor.com) enables the small business owner and the startup founder to track important key metrics for their business and websites. It allows the user to build any number of dashboards and track all kinds of metrics in one single place. Track visitors and pageviews for website. Track Twitter, Facebook, Google plus and Feedburner follower metrics. Track how fast is the website and monitor if it went down. Track the number of user signups and activity for the website and SAAS applications. Track Other dozens of Startup and Small business pre-built metrics (backlinks, SEO rank, Alexa rank etc). Extract financial and operational information stored in spreadsheets and database (including Google spreadsheet). InfoCaptor is designed for the small business owner and is absolutely free to use. It comes with quality dashboard widgets and charts. It also comes with sound alerts that can be played when there is change in data. The use of real Bells and Whistles makes dashboard more fun to use.